3 courses in different levels ! Bali Activity Ayung River Rafting offers 3 cycling trips, Jatiluwih Cycling (16 Km) through the stunning view of rice terrace, Village Cycling (16 Km) visiting monkey forest of Sangeh and Carangsari village, Batur Cycling (25 Km) down trail from Kintamani to Ubud. Jatiluwih Cycling is highly recommended! Cycling starts in the morning through Bali’s rice granary of Jatiluwih. Hotel Pick up, Morning Tea, Mineral Water, Cycling 16Km including professional Cycling Guide, Safety Equipment (gloves for free), Lunch, Insurance. Sport Shoes, Comfortable Clothes, Hat or Cap, Sunblock etc. Arrive at Cafe Jati Luwih with stunning rice terrace scenery. 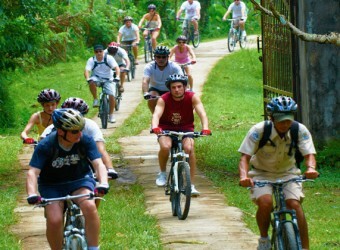 ・The participants can ride the bicycle fast or slowly ,also can take pictures on the trip. Cycling duration 2 to 3 hours. We stop at some places to view beautiful and stunning sceneries. Cycle through fruit plantations, rice terrace, hot spring, temples, meet pigs, chickens and visiting Balinese private house. ・The gloves are for free, you can bring it home. Hotel Pick up, Morning Tea, Mineral Water, Cycling 25Km including Professional Cycling Guide, Safety Equipment (gloves for free), Lunch, Insurance. * The longest distance but easy cycling route. It is recommended to beginners and children. Hotel pick up by Ayung River Rafting staff. ・Guide introduction and information of schedule etc. ・Lunch includes coffee or tea. ・Buffet is available for participant over 6 people. Need More Fun ? Here is More Tour ! All cycling courses including lunch. Buffet lunch is subject to change into set lunch (depend on the number of participants). ※Bicycles for children are available depending on child’s height. Cycling from Kintamani downhill to Ubud, I pleasantly enjoyed the cycling. The scenery is really beautiful!! It is a mountain area with the cool temperature. It was a long course and I fully enjoyed it. Tarzan Jump from the hight trees ! Tree Top at Bali Botanical Garden. 5 Adventure Circuits from one tree to another wi”"